MalwareBytes is an anti-virus and security provider, headquartered in San Jose, California, United States. 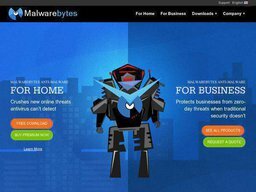 The privately held company is best know for its free and premium MalwareBytes Anti-Malware program that allows users to scan their computer systems for viruses, malware and other issues, and have infected files cleaned or removed by the software. There is also a premium edition that you can buy. Using our MalwareBytes coupons will help you get money off this purchase. MalwareBytes was traces its roots back to 2014 when 14 year old computer enthusiast Marcin Kleczynski decided to create his own security software, after the program he was using failed to detect a number of issues. The first software he released was called RogueRemover, but this was renamed to Malwarebytes Anti-Malware when he officially launched the company in 2008. Today Kleczynski serves as CEO and claims his programs have fixed over 250 million computers, of over 5 billion individual pieces of malware. MalwareBytes has over 140 permanent employees and received $30 million in funding in 2014 from Highland Capital Partners. MalwareBytes still offers their core Anti-Malware program for free, which allows you to scan and clean all threats form their database, however if you wish to use 24/7 protection while browsing the internet etc, you must pay for their premium edition. They also offer a Remediation Tool for infected networks, solutions tailored for Businesses, and Anti-Exploit tool for networks and businesses, and Endpoint Security which features a combination of them all. They also have programs for Mobile devices, MACs, as well as an Anti-Rootkit, Chameleon which allows you to install the program on already infected machines, StartUpLite which allows your machine to boot up faster, File Assassin to help you removed annoying locked files, and Reg Assassin that removes malware registry keys. To make payments to MalwareBytes you can use Paypal, Credit Cards, and Bank Transfers. In order to redeem a MalwareBytes coupon code all you have to do is copy the code over from Coupofy and paste it in to the promo box ahead of payment. At this moment in time, the service is provided digitally and all of the processing is done online. Once the payment confirmation has been received, you’ll be able to download the software. The store will also issue a receipt over to your email address and give you the license number which can then be used to unlock the programs you may have already downloaded. Some programs a free or charge, while others come with a 14 day trial so you can test it out. You will also have 30 days from the purchase date to cancel your purchase, however your user license will be revoked and the program will no longer work at its premium level. Obviously if you applied a MalwareBytes coupon code to get a discount, you will only be refunded the actual amount charged to your payment method.